Jamros Mageblood wrote: "Oh dear, that was terribly rude! Yet it was also hilarious! Didn't you think so?" I say with a smirk as I cast Tasha's Hideous Laughter on the guard diagonally left to me. Zorra (24/24) - Dash to L16, just north of Brian. Brian (19/19) - "Oh dear, that was terribly rude! Yet it was also hilarious! Didn't you think so?" Casts Tasha's Hideous Laughter on a Guard with a spear to his left. The man immediately bursts out in a violent fit of giggles, useless for now, rolling on the ground. Guard B - Popping up from concealment upon the low hill in the north, he let's an arrow fly at Sid, who thinks himself hidden. The shot goes wide, but it throws Sid off. Guard S1 - No save. Still laughing hysterically. Guard M - The guard with the mace rushes the newly arrived Zorra and swings, catching the Dragonborn with a solid thud of steel on scale for 7 damage. Guard AC - The axe captain who swung at Brian's illusion with his fist, now swings at the very real Brian with his axe, a grazing blow only for 4 damage. Brian's Hellish Rebuke singes him for 9 fire damage. Guard S2 - The second guard with a spear circles around to stab at Zorra, for a further 5 damage. Guard SS - Crashing through the undergrowth, a guardsman rushes Sid with shield and longsword. The swords misses its mark, but Sid now has a heavily armed and armored combatant in his face. As a reaction to guard AC attacking me I cast Hellish Rebuke on him (2d10 +3), then as an action on my turn I will use Shocking Grasp on him if he doesn't die. If he does I go to guard M.
Jamros Mageblood wrote: As a reaction to guard AC attacking me I cast Hellish Rebuke on him (2d10 +3), then as an action on my turn I will use Shocking Grasp on him if he doesn't die. If he does I go to guard M.
Brian's Hellish Rebuke singes him for 9 fire damage. Added to Round 1. I turn to Guard S1 and swing both of my axes down onto him with the utmost of strength! Dook wrote: I turn to Guard S1 and swing both of my axes down onto him with the utmost of strength! One axe misses, one axe hits, for 7 damage. Zorra (12/24) - Double Axe Attack on Guard S2! One hits for 7 damage. Brian (15/19) - "Be crushed by the elements themselves you brute!" Shocking Grasp on Guard AC, hits for full 8 damage. AC can't take reactions until next turn. Guard B - Bowshot at Sid, misses completely. Sid (21/21) - Spear attack at Guard SS, also misses completely. Guard S1 - Crit fails hysterical recovery, laughing sounds almost like shrieks. Guard M - Swings again at Zorra, misses. Guard AC (-17) - Swings in rage at Brian, smashes into the magicker for 12 damage. Guard S2 - Stabs at Zorra, misses. I step to the side of guard AC, (1 block south of him), and shout, "Enough! We can end this before it goes too far, my deception was wrong, but you aren't bandits are you? We can stand down and I'll release your ally from his madness ok?" (Persuasion +5) I ready to fire at AC with Eldritch Blast if they don't listen. Zorra (12/24) - Double attack! Double miss! Brian (3/19) - Move and Blast! Guard AC takes the blast to the face. You hear a crunch as his jaw is broken by the force of it. Guard AC crumples to the ground on the spot. Guard B - Another bowshot at Sid, misses. Sid (21/21) - Spear Stabby! Glances harmlessly off shield of Guard SS. Guard S1 - Comes to his senses at the sight of Guard AC dropping like a sack of potatoes. Stands up, grabs his spear, and rushes Brian for a stab! Which just barely misses. Guard M - Swings once more at Zorra, screaming some jibberish about 'ded boyos.' The mace brushes off dragon scales and chain mail with no effect. Guard S2 - Stabs at Zorra, fails again. Guard SS - Crit fails his swing and stumbles, crashing into Sid, who dodges handily as the Guard SS hits the ground in a sprawl. I bring down my spear into Guard SS's back once he has fallen. As a bonus action I want to cast Hunters Mark on the bowman. 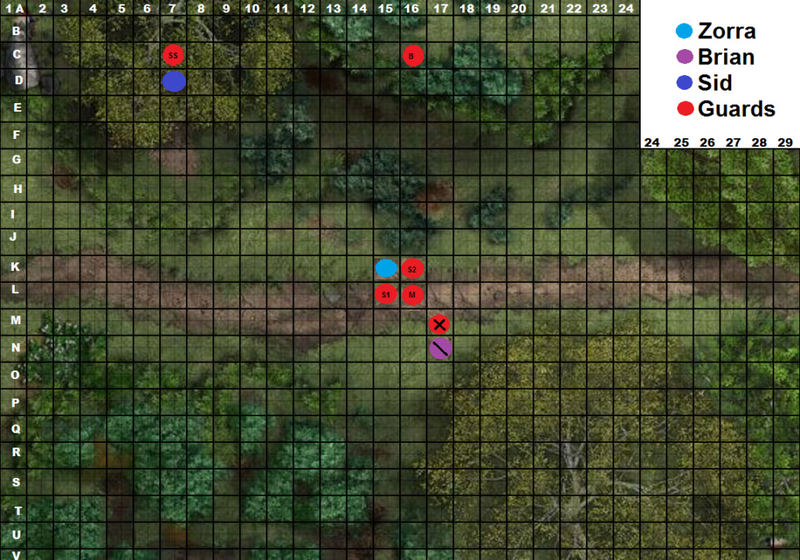 I move to K15 on the map to get at GS2's side and do a double swipe with my axes! Being up close to the guards, as a free action I try to see if they have any affiliation that I recognize. Tel to Zorra, "We need to regroup, get back to Sid!" I then dash back towards Sid's location. Zorra (12/24) - Moves to Spearman's flank - but leaves an opening for the maceman who hits full on for 7 damage. You then proceed to smash up the Spearman with one successful attack of 6 damage. Brian (3/19) - You likewise decide it's time to flee, and give the hitherto laughing spearman an attack of opportunity - which knocks you unconscious. Guard B - Shoots at Sid! Misses.... again! Sid (21/21) - Stabs down at the prone swordsman. Somehow, inexplicably, misses. Guard S1 - Stepping over the fallen Brian, stabs at Zorra - to no avail! Guard M - Steps in to swing at Zorra - hits for 2 damage. Guard S2 - Completing the swarm of Zorra, the spearman continues his assault - and only narrowly misses! Guard SS - Regains his footing and swings his sword at Sid - missing again. I disengage from Guard SS and move towards the Bowman to D13. I use the dash action to move away from being surrounded and make my way to the bowman on the hill. Zorra (3/24) - Dash is a full Action. In doing so, whatever else he had planned, when he turned he opened himself to attacks from his foes. Zorra is cold-cocked before he takes a second step. Guard B - Shoots at Sid. Finally hits, and crits, for 10 damage. Sid (11/21) - Disengages for D13. Guard S1 - moved to F14. Guard M - Checks on the dead guard, curses, and kicks the unconscious Bryan. Bryan takes another death save fail. Guard SS - comes after Sid, swinging and again misses. Guard B - shoots at Sid, finding his stride for another 7 damage. Alrighty, I use Second wind to recover some HP and Action Surge to take an extra action and attack the S2 Guard! Dook wrote: Alrighty, I use Second wind to recover some HP and Action Surge to take an extra action and attack the S2 Guard! You have given your action. Zorra is unconscious. It is now Sid's turn. I dash as far away North as I can get leaving the combat area. Tolr'ax wrote: I dash as far away North as I can get leaving the combat area. With two enemies on top of you, this was a brave move! The spear tickling your spine, however, disagrees with your tactics. You lose consciousness.